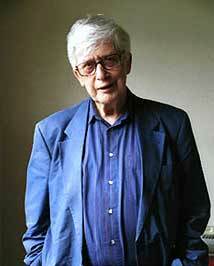 Edwin Morgan's poetry is irrepressibly experimental in imagery, subject matter, form and language. The muted melancholy of 'The Vision of Cathkin Braes' (1952) was soon overtaken by the genial exuberance which generally typifies his work. By the time 'The Second Life' appeared in 1968 he had matured into a major poet. By then, society had relaxed and he could be open about the fact that when he wrote of passionate love, he was doing so from a homosexual perspective. He began to explore themes concerning science fiction and space travel with 'From Glasgow to Saturn' (1973). The 1988 title 'Themes on a Variation' encapsulates the unpredictable curve of his approach. Edwin Morgan was born in Glasgow and studied at Glasgow University where he taught from 1947 until 1980, becoming Professor of English in 1975. His Glasgow poems are imbued with a compassionate intimacy that never elides unpalatable realities. A prolific reviewer, essayist and translator, Edwin Morgan's more recent translations include a brilliant adaptation into Scots of Rostand's 'Cyrano de Bergerac' and a verse translation of Raciné's 'Phèdre'.